All information pertaining to TISC’s current & upcoming season will be shared here. Please consult with and review this page on a regular basis for any changes and for updated details about regular venue location and practice times. TISC only operates in dry conditions, which means practices are weather dependent. Check website for updates if weather conditions are is questionable. All components of registration must be completed online PRIOR to skating with TISC. This includes I) membership application, II) waiver, III) agreeing to Equity, Climate, Governance, IV) payment, V) registration with Roller Sports Canada (must be completed PRIOR to joining TISC). Additional Informal Skates: Skaters network with each other to arrange extra sessions and unofficial practices and training sessions during the season. TISC members typically skate on public trails (Hamilton Beach, Martin Goodman Trail), loops in residential streets (Port-Credit (Mississauga) to Oakville), and in corporate centers (Max Ward Park in Mississauga, just South of the airport). WHO SHOULD SKATE AT TISC? 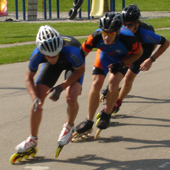 If you can start rolling, stop safely, turn in both directions, skate on a variety of terrain (up hill, downhill, rough asphalt, over curbs, hop over small obstacles), and you’re stable on your skates, then TISC is the right place for you to improve your fitness, technique, group skills, and race strategies. TISC has a supply of rental racing skates (low boots, carbon fiber shell, big wheels!) available to its members. To receive rental skates, all components of TISC membership must be complete, payment and forms must first be completed and deposits must be made prior to skates being rented. All components of registration must be completed PRIOR to skating with TISC. This includes i) membership application, ii) waiver, iii) agreeing to Equity, Climate, Governance, iv) payment, v) registration with Roller Sports Canada (must be completed prior to registering with TISC). All guests pay $10 per practice. First-time TISC guests skate that practice for free. When a guest joins TISC, guest fees are credited towards TISC membership fee. A maximum of 5 guest skates are allowed. After that, TISC membership must be purchased to continue skating with TISC. Use of helmet and hand or wrist protection is compulsory. You must wear your protective equipment at all times. Skaters 15 years old and younger must wear elbow and knee protection. Parents/ guardians can sign-off on required use of elbow and/ or knee protection. Stay alert to others using trails and streets and be courteous at all times. Be mindful of, and vigilant for, other skaters, cyclists, pedestrians and motor vehicles, which may share the road and may constitute a danger to you. Accept that occasionally you will encounter those who act in a reckless or dangerous manner. Do not initiate a confrontation, but rather, if the situation warrants it, report the person/vehicle to the police. Unless otherwise noted, all practice venues are alcohol free and smoking is prohibited. These are policies and requirements of property owners and managements of the venues and facilities where TISC holds permits for the use of the venues and facilities. I am a speedskater from Germany and will live in Toronto for 3 month. I would like to join your training. Can I just come to your training and bring the signed waiver and signed guest membership or real membership? I already have a license from the german federation of speedskating, is it also necessary to have the license from RSC? For three months, it will be less expensive to join the Toronto Inline Skating Club rather than skate as a guest. You should have membership form and waiver. The Toronto Inline Skating Club will recognize membership with another recognized Federation/ National Governing Body. thanks a lot for the great training, races and friendship. The three month with you all were an wonderful time, that I will never forget. I live in down town Toronto and I am searching for roller skater coaching classes in down town for my 5 years old daughter. Please let me know about down town nearby locations. I’m in town for the summer and would like to learn to inline skate. I have no experience, do you take on people at my level of experience? Also what is the earliest age you take on children? When you’ve acquired basic skating skills (you can stand, move, turn, and stop) and you’re looking to get into fitness or racing, please come out and try TISC TISC. For Youth, the youngest who currently skate with TISC are about 10 years old. I live in North Etobicoke area and am looking for Roller blades private coaching lessons for my 14 year old son. please suggest if there is any in west end or nearby locations ..I would like to register him in beginners course. I would also like to know the days of lessons, time and fees. Thanks in advance. I’m looking forward to the first session on Thursday. I have a lot of varied skating experience, but no inline skates yet. I see that you have rental skates available. Would it be possible to come a bit early on Thursday to set up a rental? (I have all the forms, etc. ready to go). Thanks so much! Hi Kerry- I will e-mail you in a few minutes re. the rental skates. Looking forward to seeing you out on Thursday. My daughter is a skater who is 8 years old and like to find the best place to continue her inline skating practice. we are currently living in Beijing. Is there a 200 meter banked track in Canada? Hello Qi- the Toronto Inline Skating Club will run an outdoor program from early April 2014 to the end of September 2014. We will likely use a 200-meter flat track as well as a 400-meter flat track in the West-end of the City of Toronto. I’m planing to go for the Coming up Thursday session. I used to be a competitive inline skater in Colombia (long time ago) and because I love this sport so much I would like to try skating again just for fun. I see that you rent skates, what can I do to rent them for this coming Thursday.. Also I’m excited to meet the group and start skating again. I’m glad to read you’re interested in skating with the Toronto Inline Skating Club. In order to rent skates from TISC, you have to join TISC, and once you’re a member, there’s a $400 deposit that’s required. If you just want to come out and skate as a guest, your first time is free and then it’s $10 each time, up to 5 times maximum. Let me know what size you are (european sizing if possible) and I’ll see if we have your size and I’ll have them this Thursday. Please note that if it’s raining, we’ll cancel the practice.